Who says you can't go home again? Director Barbet Schroeder returned to the scene of his childhood for an examination of the extreme violence in the city of Medellín, Columbia. From the novel by Fernando Vallejo and adapted for the screen by him, Our Lady of the Assassins is a powerful and horrifying vision. Just as Schroeder returned to the streets of Medellín to make his film, often working under severe danger from locals, the film traces the journey of writer Fernando Vallejo, who decides to return home from the United States to his roots in Columbia after an absence of more than thirty years. When he meets a young street boy in a brothel, the city takes on a new reality, as Fernando sinks deeper into the perversion of his city. Our Lady of the Assassins, despite its controversial themes, is a class production. The homosexual coupling scenes are tastefully done. Violence is frighteningly casual. Kids in the street just run around popping one and other off like it's nothing. 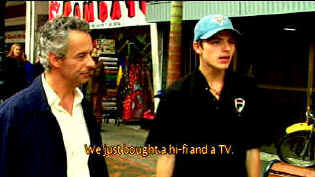 Life is cheap in the streets of Medellín, Columbia. There are so many murders in this film and it's almost as if the writer is provoking the kid because he knows what's going to happen every time he speaks out in confrontation. Does Fernando become so accustomed to the violence that he too takes it as a casual every day part of Medellín? The language and the imagery of the language is quite poetic. Glory is a statue that gets shat on by the birds, such is the state of Medellín. When vultures circle of mass of decaying bodies, Fernando observes that it's as he wants to wind up, like that corpse, inside a lovely bird flying. The poetry soars In this twisted world the street children give sacraments to beggars. The relationship between the writer and the young boy almost reflects a meeting of the old world and the new world. Germán Jaramillo as Fernando, the ex-patriot poet returning home to die and young Anderson Ballesteros as Alexis are equally convincing. This is the first acting experience for Ballesteros, whose own life is all too close to the character he plays. Schroeder's work with the "new" actors is outstanding. They seem very natural, like characters in a documentary. Schroeder's choice to shoot Our Lady of the Assassins on High Definition Video provides a uniquely transparent window into the raw violent society of Medellín. Cinematically, the vision comes close to a documentary feel or a totally new order. The opening images are 100 percent transparent with incredible depth. It's almost like a window into the film. It's shot in High Definition Video. The colors are very good, but it doesn't look like film; it almost looks too real. Contrast range is too even, likely owing to the HD. The color renditions are good but it does take some getting used to. I could put a live can of coke up against the image on the screen and it would look close to the same. It's a clean image, not at all edgy. Black levels in the night are mostly washed out. The Dolby Digital 5:1 surround compliments the hyper reality very well. Yellow English subtitles are clear and easy to read.